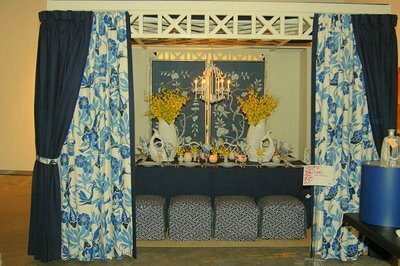 Joe Nye describes his design for the guest suite of the 2006 House Beautiful Designer Showhouse, at Aqua Allison Island, as "Sister Parish meets Miami." 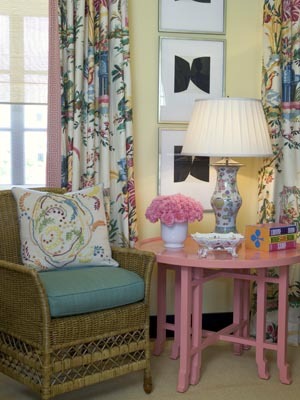 Some of the Sister Parish trademarks include painted furniture, a plumped-up daybed covered in watermelon-pink diamond-quilted chintz, a skirted table and an abundance of pillows. 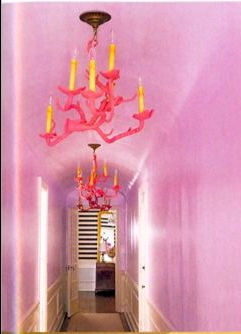 The nod to Miami, Nye says, is in his use of saturated high intensity color. 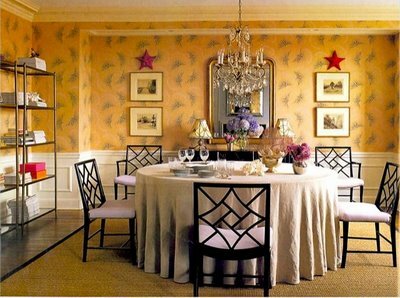 My favorite aspects of the room are the oversized lantern over the dining table and, of course, the framed 1940s chinoiserie wallpaper panels. 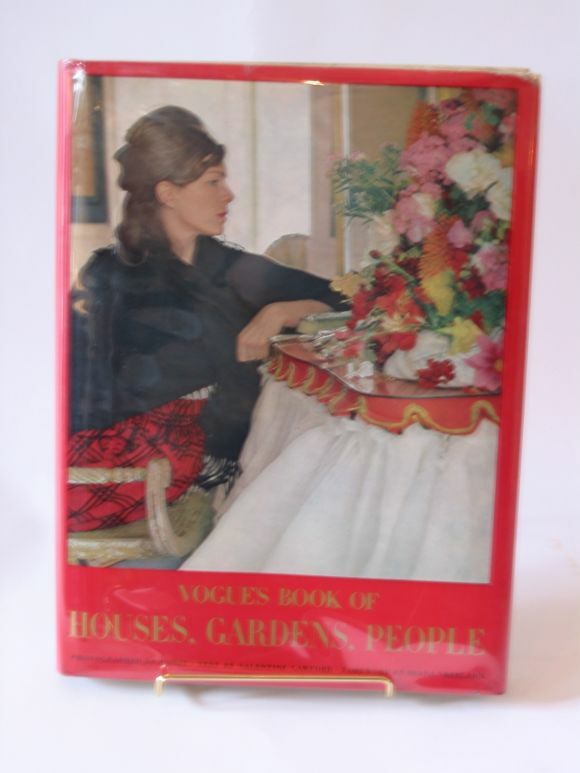 Here's a link to video that highlights many of the dressmaker details seen in the guest quarters: Joe Nye Studio Apartment. 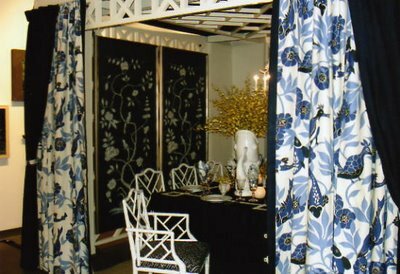 Below is an image of the "lady's office" Nye designed for House Beautiful's 2005 showhouse that benefited the Children's Action Network. 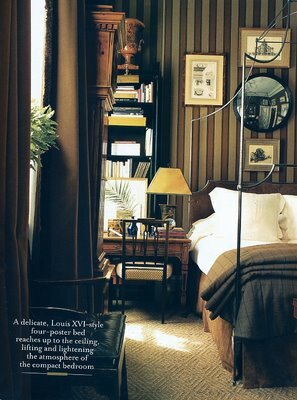 The walls are upholstered in a chocolate brown linen that nicely sets-off classic blue and white Chinese export porcelain. 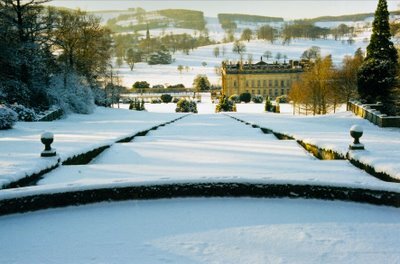 If you are interested in the architecture and interiors of Britain's great old country houses, Chatsworth is worth a virtual visit. Remember Chatsworth House, used for the exterior of Pemberley in last year's film, Pride and Prejudice? 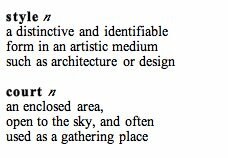 The official website of the centuries-old estate -- England's largest private country house -- is very comprehensive, with good images. The pictures above show how magical the place becomes for Christmas celebrations. 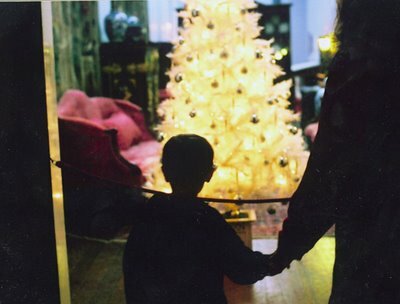 BTW: Domino editors recommend Chatsworth: The House for holiday giving. 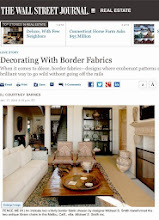 Textile designer Madeline Weinrib has been featured in all the major design and style mags, including Vogue and Elle Decor, and her name pops-up often on design blogs as well. But I wanted to share this link to her website for anyone who might not be aware of it. 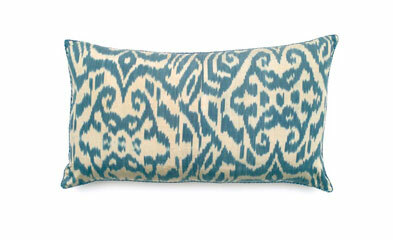 You can view a lovely array of Weinrib's designs such as the ikat pillows above, and press clippings too. 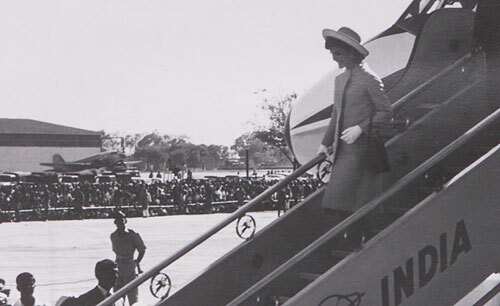 There is an official David Hicks site with archival images of the late British designer's work and his travels. One section shows photos of objects and sites seen during a journey in Africa, which later inspired some of Hicks's designs. Interestingly, a large silver Ethiopian cross was among the items that drew Hicks's eye. 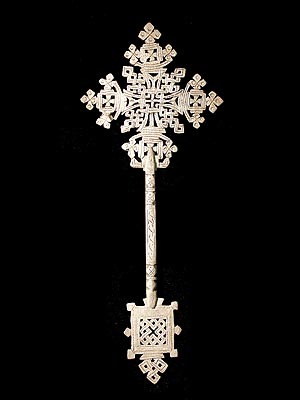 These traditional, snowflake-like, intricately cut or incised processional crosses from Ethiopia have been carried for centuries by African priests during festivals and church services. 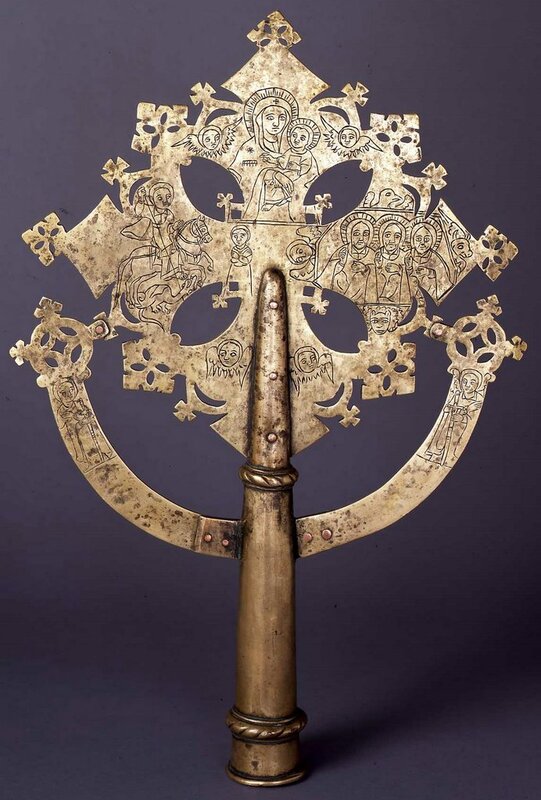 Ethiopia happens to be Africa's oldest Christian nation, dating from c. 325 AD., and scholars believe that the elegant brass and silver crosses first appeared during the Gondarian period, 1632-67. 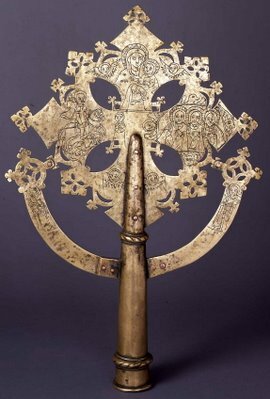 Shown above is an amazing late-18th-century brass processional cross from Ethiopia (Gondar) that belongs to Emory University's antiquities museum, the Carlos. If you are in Atlanta, it is definitely worth a look. 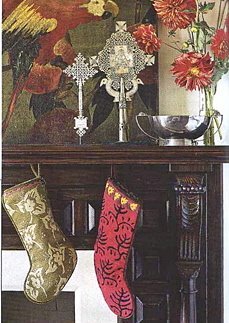 As I wrote a while back, smaller versions of this style cross were seen last year in the December House Beautiful, in a Christmas vignette done by designers Schuyler Samperton and Anna Hackathorn. 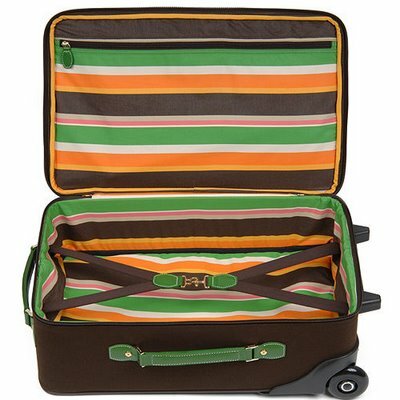 It's a lovely idea for someone who celebrates Christmas but eschews cutesy pieces and has a globe-trotter decorating style. Also this season, Wisteria is selling a 29" tall African silver cross with the same characteristic lacy details at each of its points. 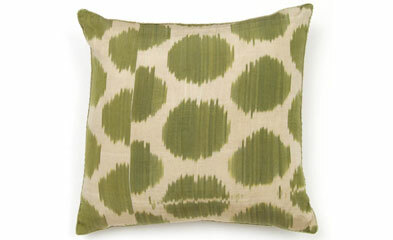 To see a wider array of sizes, patterns and prices, visit the Hamill Gallery. 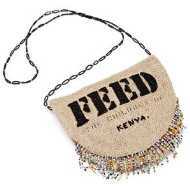 A few gift ideas for the adventurous globe trotter in your life. To shop, click the images in the grid above or see more of my Gifts for the Traveler list at ThisNext. Shown above top: Kelly Wearstler's design for Tides South Beach, with geometric room dividing screens that resemble patterns originally found in North African and Middle Eastern architecture -- these patterns inspired British designer David Hicks in the 1960s and 70s; Jacqueline Kennedy arriving in India, 1962, as seen in the exhibition, "Jacqueline Kennedy: The White House Years" May 1, 2001 to July 29, 2001 at The Metropolitan Museum; Kate Spade's Libson carry-on in chocolate and Kelly-green. BTW: Several of the gifts above are from Highland Gifts For Men, a stylish boutique located at 1002 Virginia Avenue., in the heart of Virginia Highland. Stop by for a bit of male-focused shopping, for a change, if you are in the Atlanta area. Kate Spade's fresh interpretation of the peacock motif was a huge hit this season when used on holiday plates, mugs and cards. Now the lively design is available embroidered on a seagrass resort tote. Peacocks are often associated with age-old Tree of Life designs seen in textiles, and I think Spade has really captured that vibrant spirit in a clean, modern way. 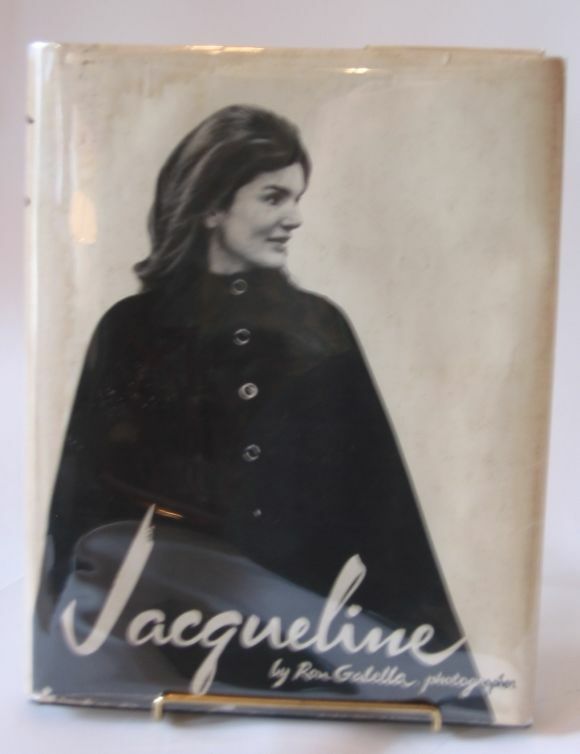 BTW: If you are passionate about textiles, or have someone of your shopping list who is, Sylvie has some great magazine and book picks posted. 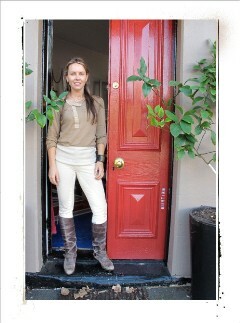 I didn't really intend to make this "Anne Coyle Week" on Style Court. 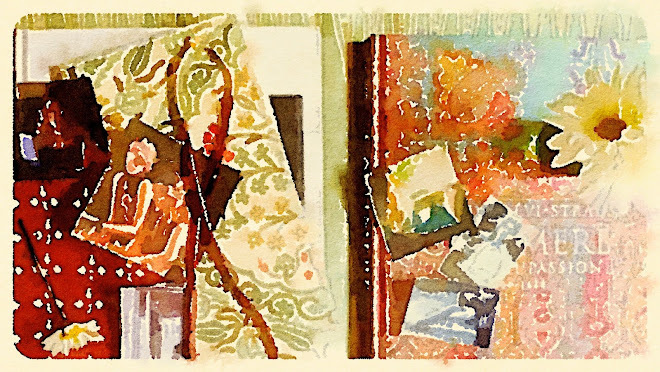 Still, the launch of her new site has been fun and I want to share a few more samples of her vibrant use of color. 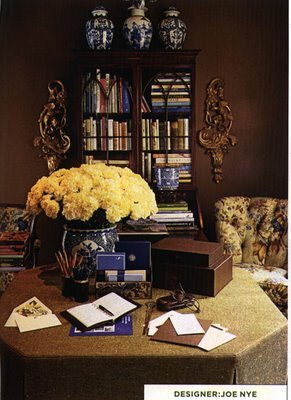 These images are in my inspiration notebook and came from Elle Decor, March and May 2005. 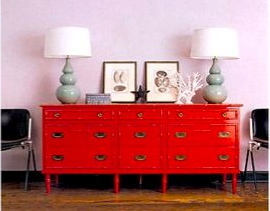 Refreshing sorbet colors punctuated with a bit of high-contrast black lacquer or chocolate brown -- sometimes a hit of red -- are her signature. 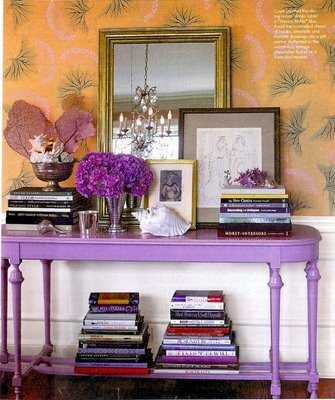 Lavender, which she has described as the new neutral, seems to be her favorite. But Coyle's range extends beyond pastels: check-out her press coverage in O at Home, spring 2005, shown on her site. 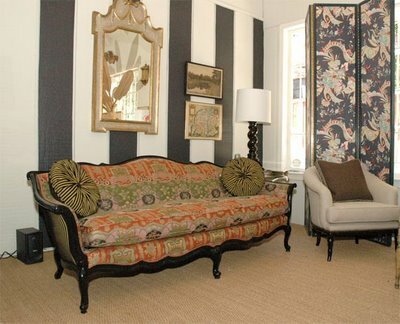 Crisp striped walls have never been out of style, but lately I've noticed a resurgence of boldly contrasting dark and light lines. 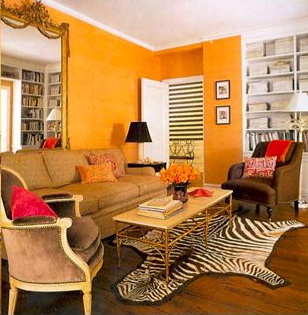 Maybe it's the renewed interest in old school decorators who favored stripes and symmetry, such as Elsie de Wolfe. 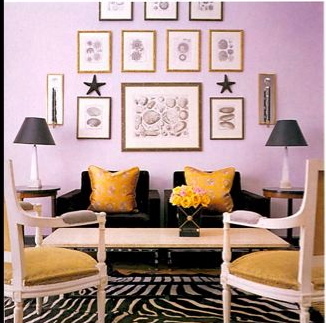 Shown top, Chicago designer Anne Coyle's apartment entry as seen in Elle Decor, March 2005. Below that, the interior of Chapman Radcliff and last, Kate Spade in her own home, as seen in Town & Country, October 2004. 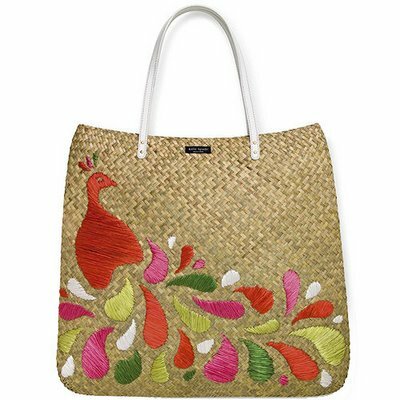 With the holidays approaching, Coconut Company, has added to its online selections more great vintage design, art, and style titles. Coconut does not list the book prices on its site, so you have to inquire by email or phone if interested. Unfortunately, for some rare and in demand titles the prices get quite high. If fundamentally you have classic taste but you're drawn to fresh rooms with contemporary patterns, bookmark Chicago designer Anne Coyle's new site. 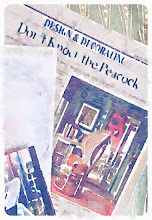 Although the site is not yet complete, you can browse Coyle's press clippings for a good sense of her style. 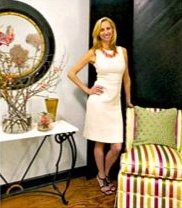 A follower of David Hicks and Madeleine Castaing, Coyle uses elegant furniture and lighting -- pieces that never go out of style -- then has fun with unexpected color or prints on walls and upholstery. 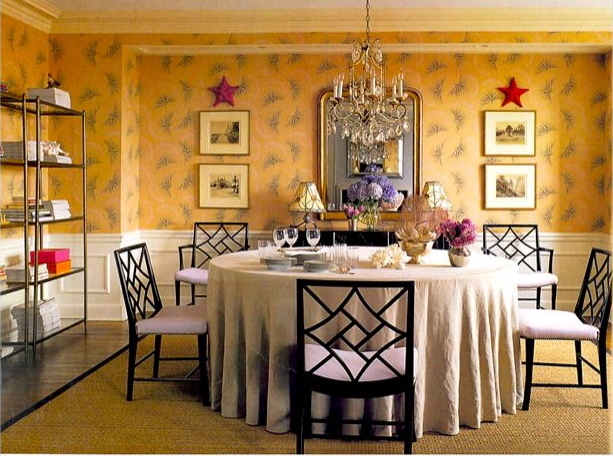 Image top is Coyle's dining room as seen in the Chicago Tribune, with wallpaper by Neisha Crossland; second view of dining room and library image are from Elle Decor, March 2005. 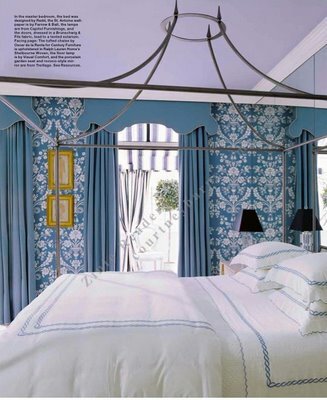 During the past few years, various incarnations of an airy Louis XVI-style four-poster bed seem to have popped-up in Miles Redd's projects. 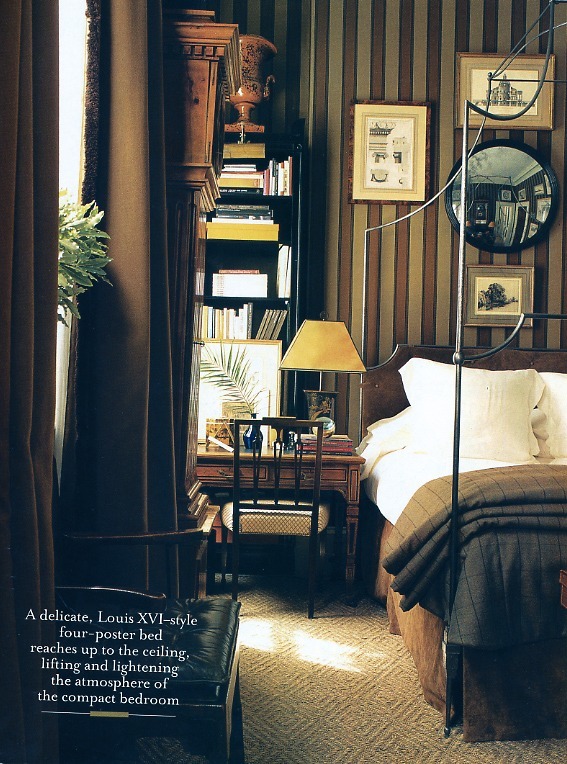 I know the current November Domino features Anthropologie's version of this iron Louis bed in a Marie Antoinette-inspired spread, but to me Miles does a bedroom like no other, so I thought I'd share a few examples. 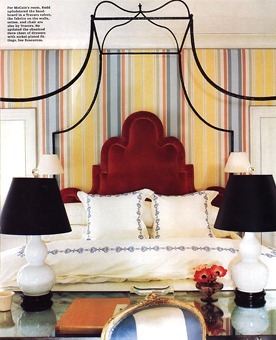 Shown above top is a bedroom from Elle Decor, March 2006; below that, the next image is a whimsical feminine bedroom seen in Elle Decor, March 2001; below is another fab bedroom seen in Domino, October 2005; followed by a masculine bedroom from Redd's online portfolio. When I studied furniture history, we had to design a piece of our own inspired by an antique, and then create a scale model. I wish I'd thought to do a bed similar to those shown above. 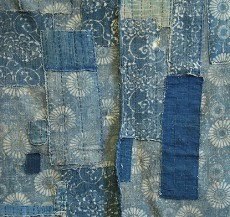 Some heavy gauge wire, scraps of beautiful fabric, a staple gun and hot glue -- it could have worked! 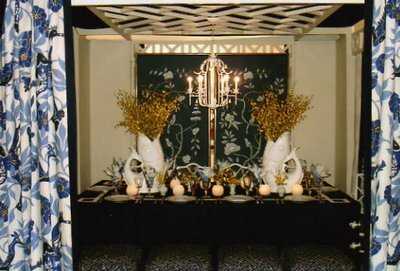 When Kelly Crago Hansen told me that the work of famed British designer Oliver Messel inspired in part her vignette, shown above, for last month's fundraiser Dining By Design, Atlanta, I was intrigued and wanted to share more highlights here. Interior design was a second career for Messel, one of England's most celebrated costume and set designers during the 1930s-50s. 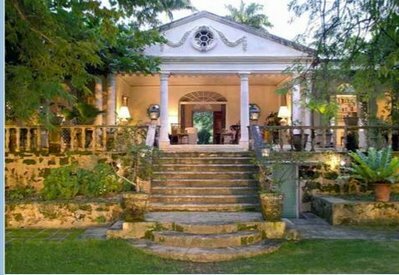 In the swinging 1960s Messel escaped to the Caribbean where he designed villas for fun-lovers such as Princess Margaret, incorporating his signature style -- clean white spiced with strong color, elaborate plaster mouldings, Palladian-style architecture, and a general mix of baroque and classical. 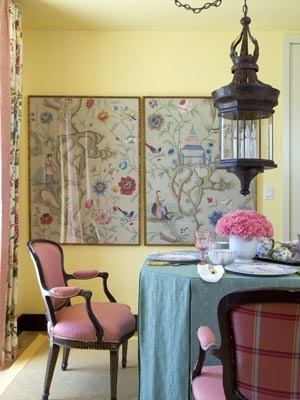 I think Kelly truly captured this feeling of easygoing, tropical elegance at Dining By Design. Apart from designing the required tablescape, Kelly created the illusion of an outdoor room complete with a Chinese Chippendale ceiling, a faux bamboo chandelier and cabana-like curtains made from Lulu DK's Paradiso. Those custom-colored bird and vine panels are de Gournay. Kelly adds, "Part of my inspiration was a project I'm working on at the new residences under construction at Ocean Club in the Bahamas -- this is kind of a dream because growing up in South Georgia, [near the Gulf and Atlantic coasts] I along with my parents loved tabby architecture, which about 15 years ago led me to almost an obsession with Oliver Messel...As far as the blue and white -- it kind of perplexes me because I'm a green freak -- I think I wanted to update a very traditional color pallet. Although now it reminds me a little of Casa de Campo meets South Florida, captiva with family circa 1970s-80s -- updated of course." Shown below, the exterior of Messel's Cockade House, Barbados. 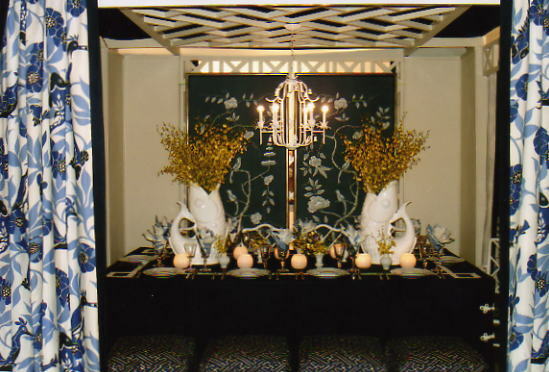 BTW: If you are in Chicago this weekend, don't forget to attend Dining By Design, Chicago. Public table viewing takes place Friday, November 10 and Saturday, November 11 from 10 a.m. – 2 p.m., at the Merchandise Mart. Admission is a $10 donation to DIFFA at the door. Thanks for the reminder Paper Lily! 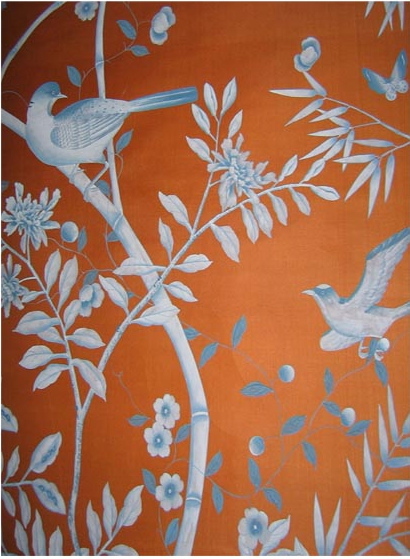 Shown above, Fromental's Paradiso, a hand-painted, silk wallcovering in copper iron inspired by traditional 18th-century Chinoiserie pieces. 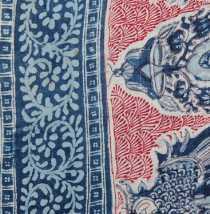 If you are a design student interested in learning more about the history of this style wallcovering, The Victoria and Albert Museum has a nice online Chinoiserie style guide, as well a strong textile section.